Our Abpromise guarantee covers the use of ab50967 in the following tested applications. WB Use a concentration of 1 - 5 µg/ml. Detects a band of approximately 223 kDa (predicted molecular weight: 223 kDa). 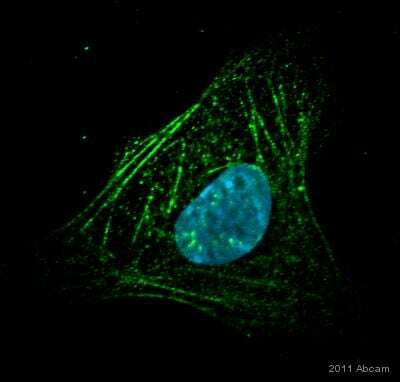 Immunocytochemistry/ Immunofluorescence - Anti-heavy chain cardiac Myosin antibody [BA-G5] (ab50967)Image courtesy of an anonymous Abreview. 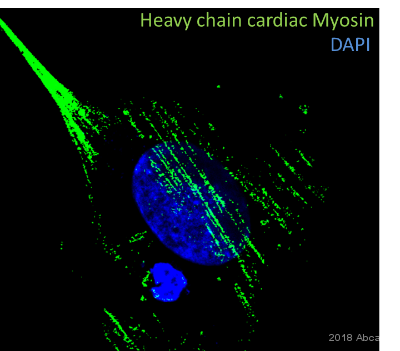 ab50967 staining heavy chain cardiac Myosin in murine HL-1 cells (derived from an atrial tumor) by Immunocytochemistry/ Immunofluorescence. Cells were fixed in paraformaldehyde, permeabilized with 0.5% Triton X-100, blocked with 10% serum for 30 minutes at 21°C and then incubated with ab50967 at a 1/200 dilution for 16 hours at 4°C. 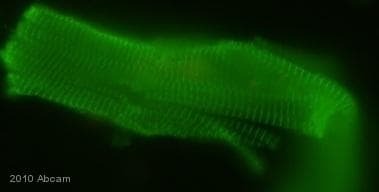 The secondary used was a goat anti-mouse polyclonal conjugated to Alexa-Fluor 488, used at a 1/400 dilution. Counterstained with DAPI. 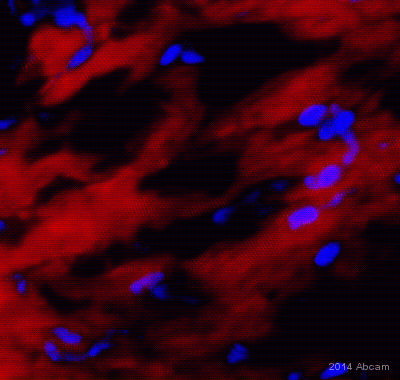 ab50967 staining mouse heart tissue sections by IHC-P. Sections were formaldehyde fixed and subjected to heat mediated antigen retrieval in citrate buffer pH 6, prior to blocking with sequential peroxidase and protein block (prediluted) for 20 minutes at 20°C. The primary antibody was diluted 1/100 and incubated with the sample for 45 minutes at 20°C. 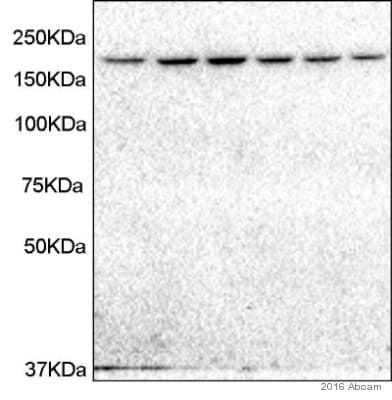 A HRP conjugated goat anti-mouse antibody was used as the secondary. 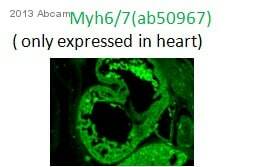 Immunocytochemistry/ Immunofluorescence - Anti-heavy chain cardiac Myosin antibody [BA-G5] (ab50967)Image from Mayers CM et al, J Biol Chem. 2010 Apr 16;285(16):12344-54. Epub 2010 Feb 5, Fig 3.
ab50967 at a 1/200 dilution staining heavy chain cardiac Myosin in murine heterozygote cardiomyocytes by Immunocytochemistry/ Immunofluorescence. Additional bands at: 48 kDa, 95 kDa. We are unsure as to the identity of these extra bands. 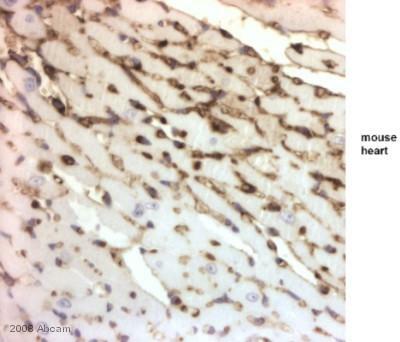 ab50967 staining heavy chain cardiac Myosin in Mouse whole embryo tissue sections by Immunohistochemistry (IHC-P - paraformaldehyde-fixed, paraffin-embedded sections). Tissue was fixed with paraformaldehyde and blocked with 20% serum for 30 minutes at 22°C; antigen retrieval was by heat mediation. Samples were incubated with primary antibody (1/100 in 5% Goat serum) for 16 hours at 4°C. An undiluted Alexa Fluor®488-conjugated Goat anti-mouse IgG polyclonal was used as the secondary antibody.